It’s taken longer than expected to get over this flu/cold/cough thing – it’s been a right vengefull bugger in hanging about and draining me of my life force! 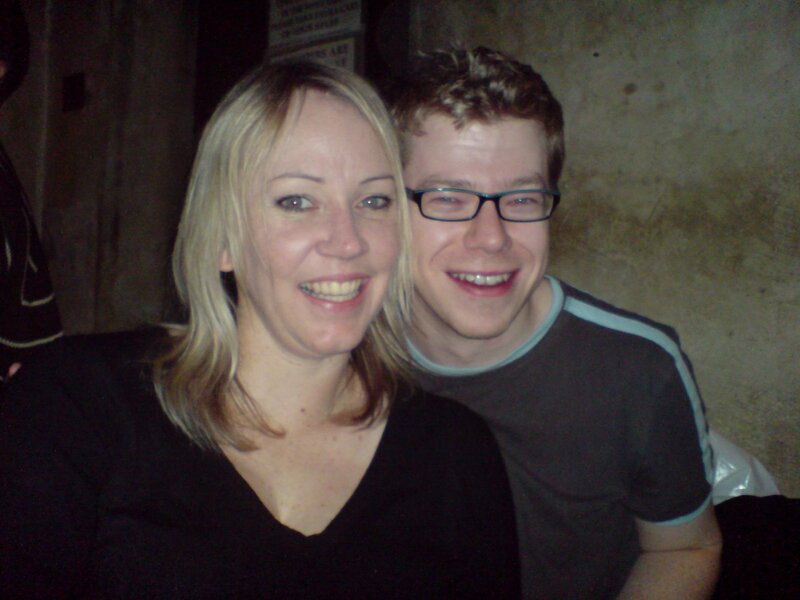 Since the last blog, I didn’t even make it into work that week – and I cancelled going out Friday night to meet Margo, and also Saturday night out to Andy’s farewell do and beers with Morrish! 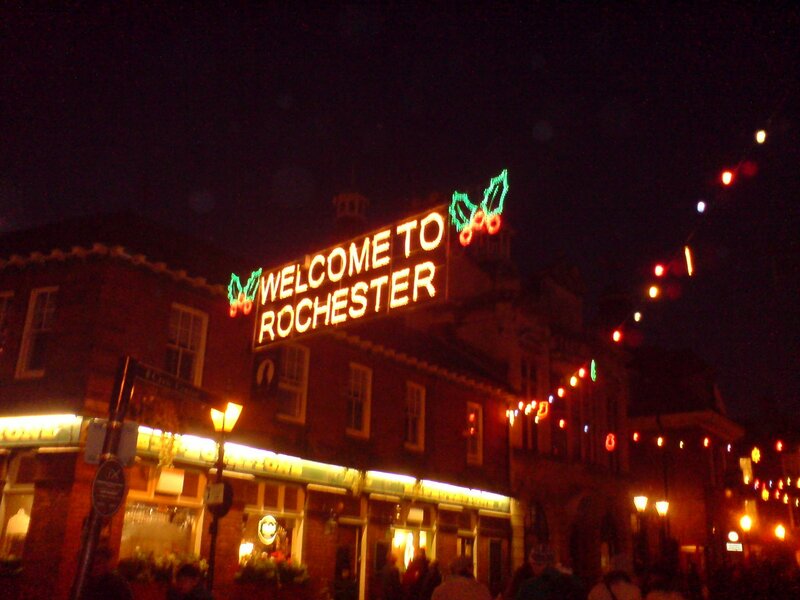 I was however, determined to make it to Rochester on the Sunday to meet up with Kate for the Dickens Festival – I was not going to have spent the whole week indoors suffering – so had made the decision to save all my strength for the festival and cancel Friday/Saturday nights out. So, off I went to Rochester on Sunday (bringing Anna with me as she’s never done the whole ‘Ye Olde English’ thing before (being an Aussie!)). 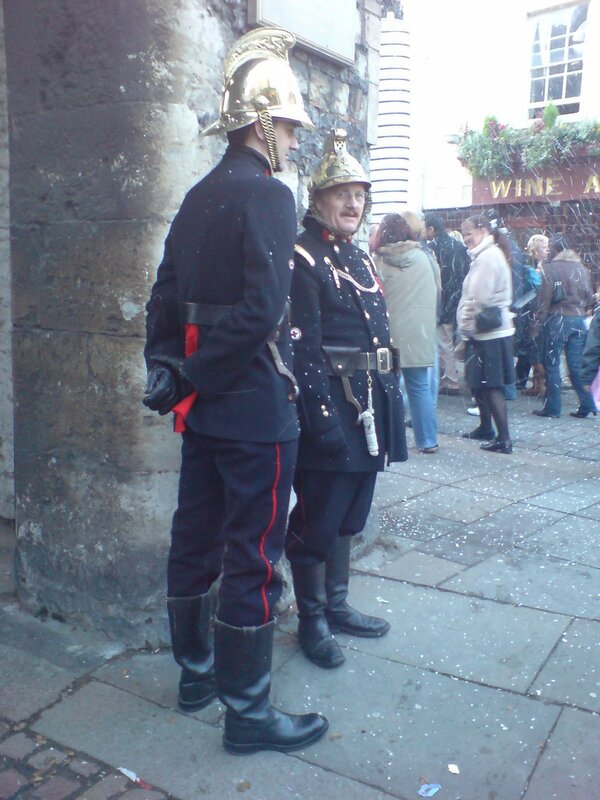 And there was plenty of ye olde english people to look at! 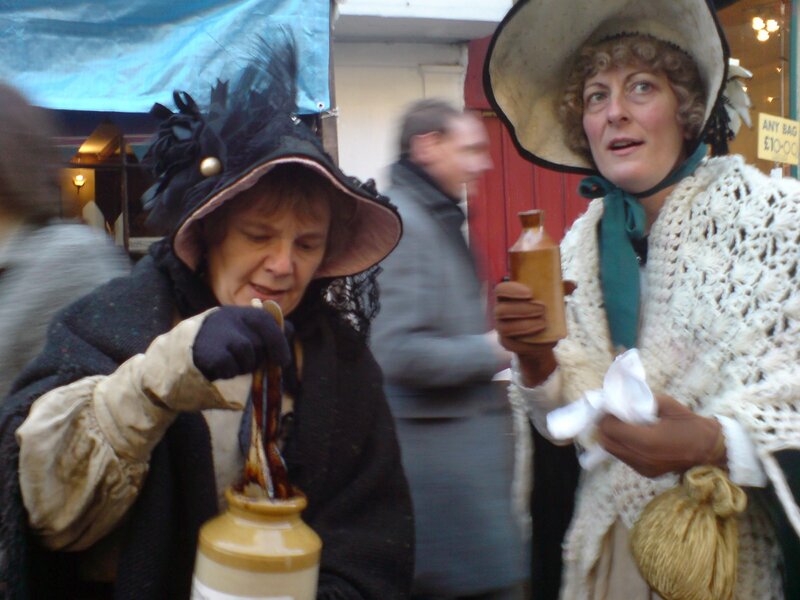 All very strange…… They even had fake snow, just like in the Victorian times!!. We weren’t all dressed up in costume! Although i don’t think anybody told we Arran that! But Naomi & John didn’t seem to mind! There’s one thing to note about Rochester – it’s mainly full of white people. 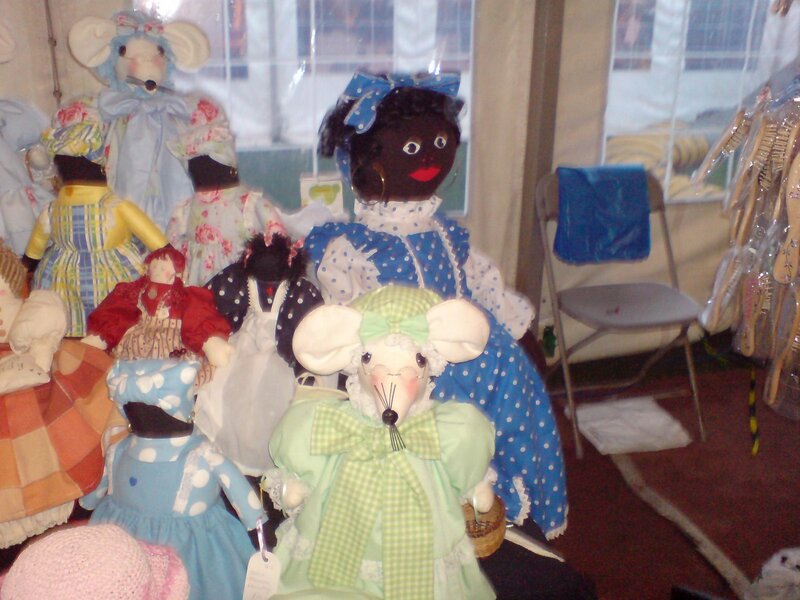 I known this because when we were in Rochester castle at the craft market there were whole stalls of Gollywogs!! They even had ‘Black Mama Doorstops’!!!! 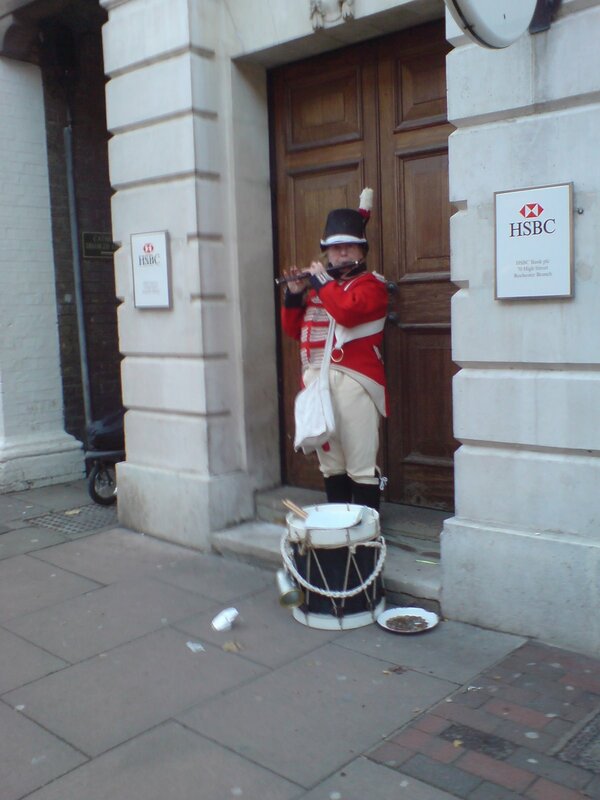 Somehow, I don’t think that they would get away with that in London!! Apart from hacking my lungs up, it was a fantastic time and I’m really glad that I made the effort to go along – I really enjoyed the festival and the mulled wine with Brandy went down a treat! 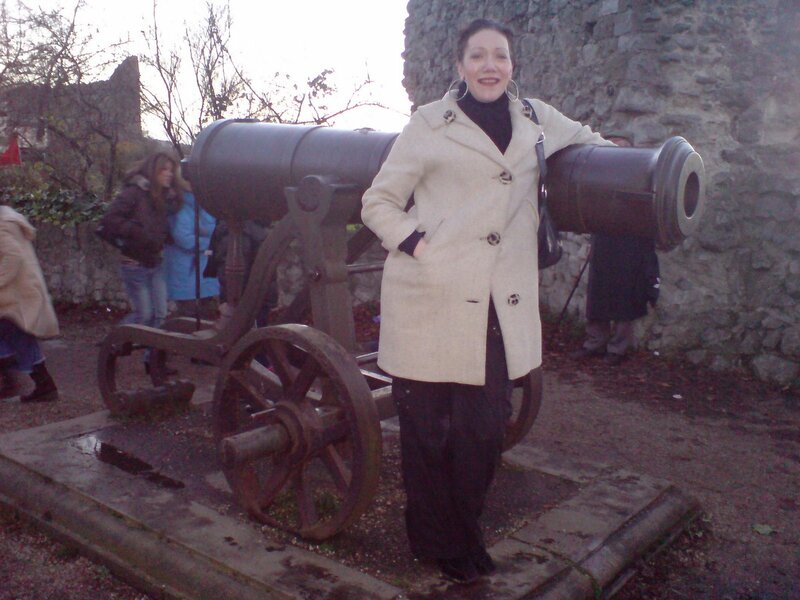 Anna enjoyed the olde english thing, and loved the castle with it’s crumbling walls and big cannons! After the festivaties ended we all wandered back up to Kate and Matt’s for some lovely hot food and wine before heading back to Londonium. After we left Kate & Matt’s we wandered back to the station to catch the train. By this point, I was almost dying on my feet – it had been a fab day, but I was absolutly exhausted!! This bug had taken more out of me than I realised. By the time we had gotten into London, I was practically crawling off of the train, I knew I couldn’t face the trauma of public transport to get home so crawled straight into a cab at Charring Cross and straight home for bed! I didn’t sleep too well – bloody kept coughing all night, so decided to work from home that day. I was still exhausted when I woke up, and really didn’t have any energy at all. Tim phoned up later on that day and wanted to pop over, but there was a catch! He wanted to watch the Watford game on the telly in the evening. I don’t have sky sports. So, I arranged to meet him up in Ryans Bar on Church Street to watch the game and grab some food. Even walking up to the pub tired me out. As soon as the match was finished, it was back straight to mine and off to sleep. I was dead on my feet. Well, I made it into work. Managed to do a wee bit of work and catch-up, left work early (As I was still coughing and knackered!) and came home and straight to bed. I began to feel a bit better, and managed to get a lot more work done – oh how easliy I forgot how ill I was!!! My team got invited to ‘Post-Pre Budget Report’ drinks by the Generaly Expenditure Policy team in the lightwell to celebrate another successful PBR…… and once the wine had all been drunk in work, we all decanted to the Westminster Arms to carry on the celebrations. Oh I don’t feel that great. I think I over did it the night before, as I am sneezing and snotting all over the place! Have I managed to re-catch the cold again?? Maybe it was just being in a smokey pub that’s done me in?? But it’s not all doom and gloom… My new shinyness has arrived! I’ve got my new Freeview box delivered!!! What’s so special about this box? 12 month warrantyI unpack my new shinyness and get it all set up, making sure that it all works before I head into work and snot and sneeze my way though the day. Of course, I leave work early as I’m knackered and with a very red nose!, head home to play with my new toy and sleep! I seem to be feeling a wee bit better today. I’m getting frustrated that I can’t get one of my reports to work, but there is good progress on all the other reports – so not all is lost! However, I do have our directorate conference to go to from 2pm till 5pm and am not relishing the thought too well! I give Dorian and Joanne the chance to duck out of the conference if they would prefer to stay at their desks and continue working on the reports and guidance. What do you think they did?? They jumped at the oppertunity to duck out of the conference!!!! So, that just left little old me having to sit in for the whole of the DQ branch! After the conference was finished, there were directorate drinks afterwards (although not much wine supplied!!!) which wasn’t too bad. 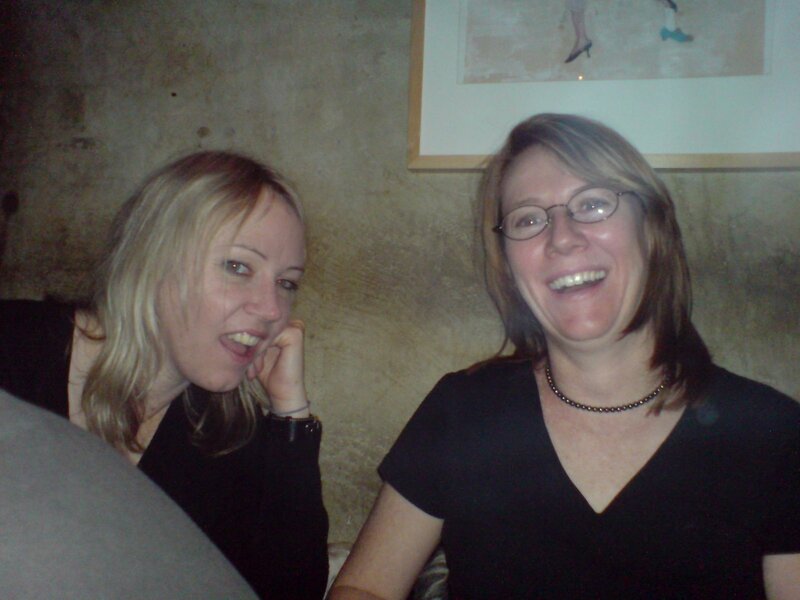 However, I was mindful to pace myself as Anna and I were heading out to ‘Frevds’ http://www.london-drinking.com/58.htm, to meet up with another old Aussie friend of mine’s ‘Margo’, whom i hadn’t seen in ages!!!. We catch the No.24 bus outside work up to Shaftsbury Avenue and wander along the side streets to avoid all the traffic and tourists, and acccidentily find ‘Coffee, Cake & Kink’ , http://www.whatsyours.com/host/php/index.php?whsmodule=welcome, – a wee coffee shop where Dorian sells some of his art from and pop into the shop to check it out before we head up to Frevds to meet Margo. Frevds was absolutly hoachin! But I spotted Margo easliy and managed to get a seat for Anna and myself. To be honest, I didn’t think much of the bar – it was way too crowded for my liking and the music was way, way too loud – but on the upside it seems to make a hell of a lot of cocktails!! 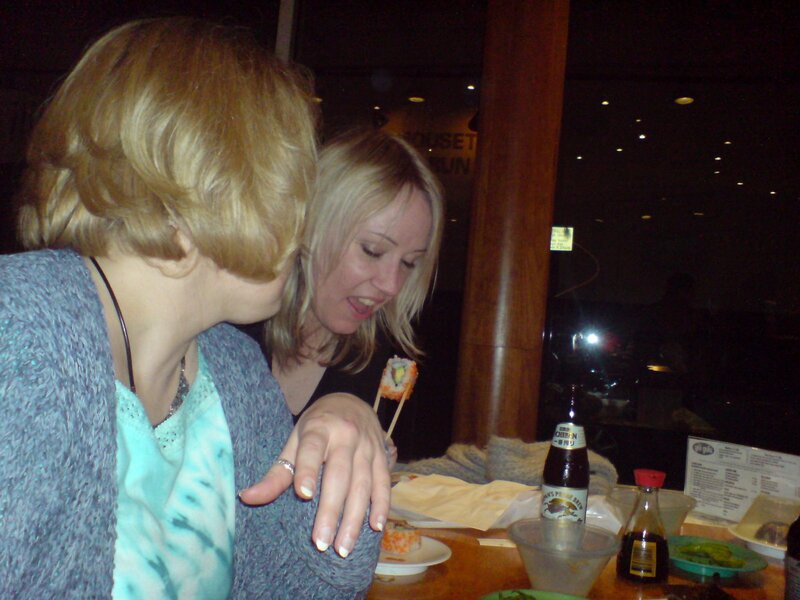 After a while the hunger pangs kicked in for a few of us and the decision was made to find a Sushi place to eat – I wasn’t in a ‘raw fish’ mood – but was bloody starvin so went along anyway. 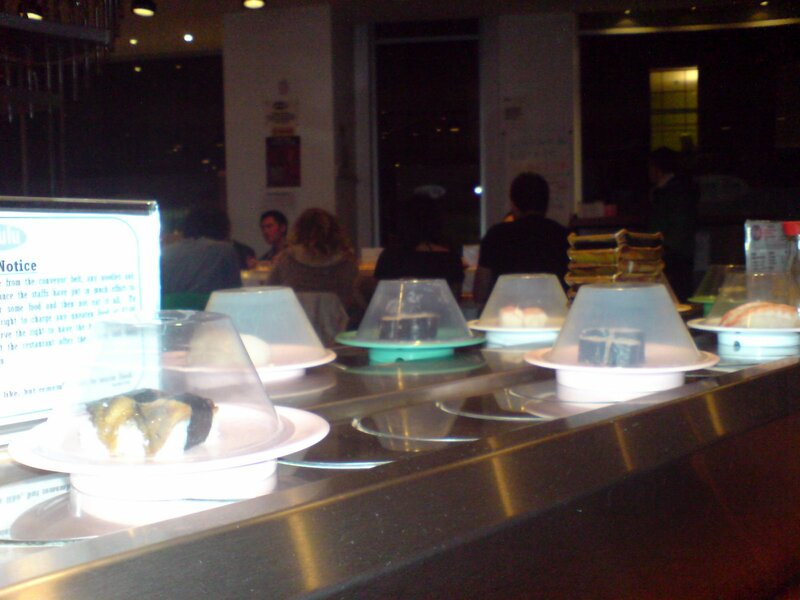 We ended up in Gili Gulu, http://www.london-eating.co.uk/5279-2.htm, And, actually, it wasn’t too bad! We opted for the eat as much as you want for £13.95, and you just pick what ever dishes you fancy from the convayer belt. and eat we certainly did. 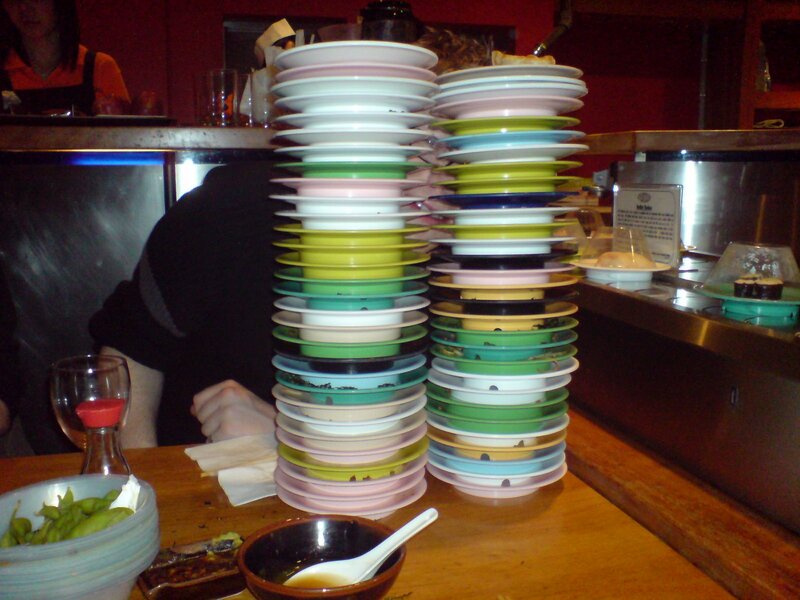 We even managed to eat through 60 plates of food!! Of course, there was six of us!! After the meal, we all went our seperate ways and headed home. Glen had texted me earlier on in the week and asked if I was interested in going to see ‘Placebo’ today, but it was Christmas shopping day for me!! As much as I like Placebo, I really, really needed to get my Christmas shopping done. It was a lovely offer, but the shopping had to get done! I headed down to Oxford Street for around 10am, and by 12pm I had completed all my christmas shopping! I was just about to jump on the bus back home when I got a text from Anna – she was nearly on Oxford Street and did I want to meet up?? So I caught up with Anna (with all my Christmas shopping in tow! 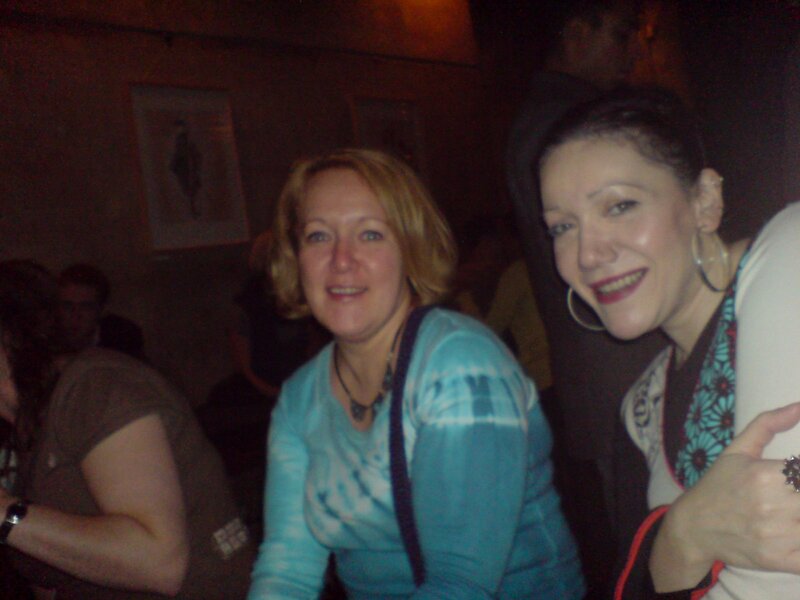 ), and we wandered to the Slug and Lettuce just off of Regent’s Street, http://www.londononline.co.uk/restaurant/670/, for some Nacho’s and a couple of bottles of wine…..
Shopping is hard work you know!!! 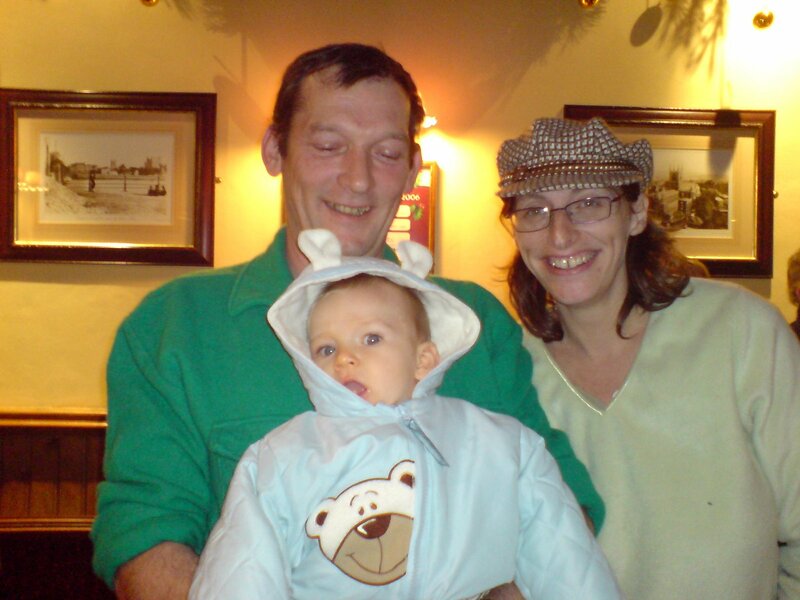 We headed back up to Stokie, dumped all my Christmas shopping back in the house, chilled out for a bit then walked over to the Shakey where we met up with Teresa for drinks. Anna didn’t stay that long as she was tired, but Teresa and I carried on in the Shakey and also got some pizza before heading home! Today is wrapping up Christmas presents and writing out Christmas cards!!! I have one more weekend left in London, so I’ll get all the wrapping done today so i can concentrate on finishing off all the domestic stuff next weekend before I head back north on the 22nd. 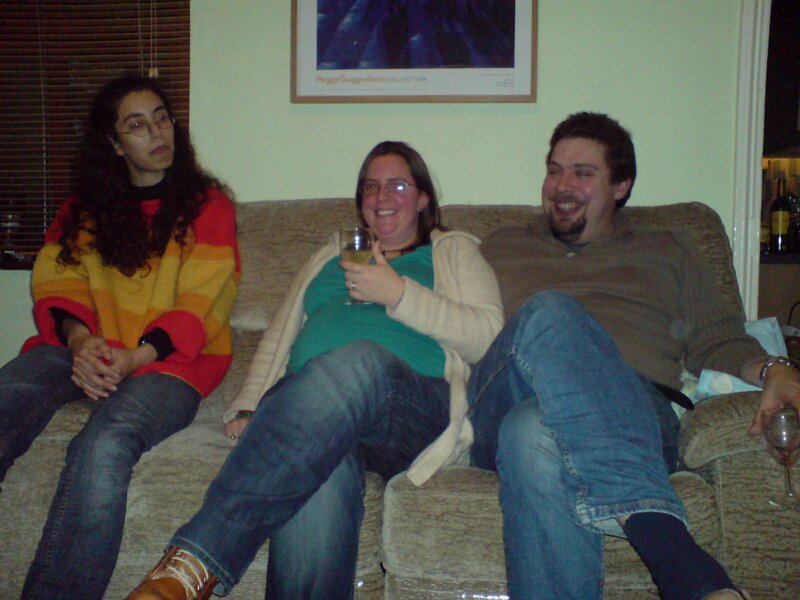 10 Dec	This entry was published on December 10, 2006 at 5:01 pm and is filed under Personal Blog. Bookmark the permalink. Follow any comments here with the RSS feed for this post. 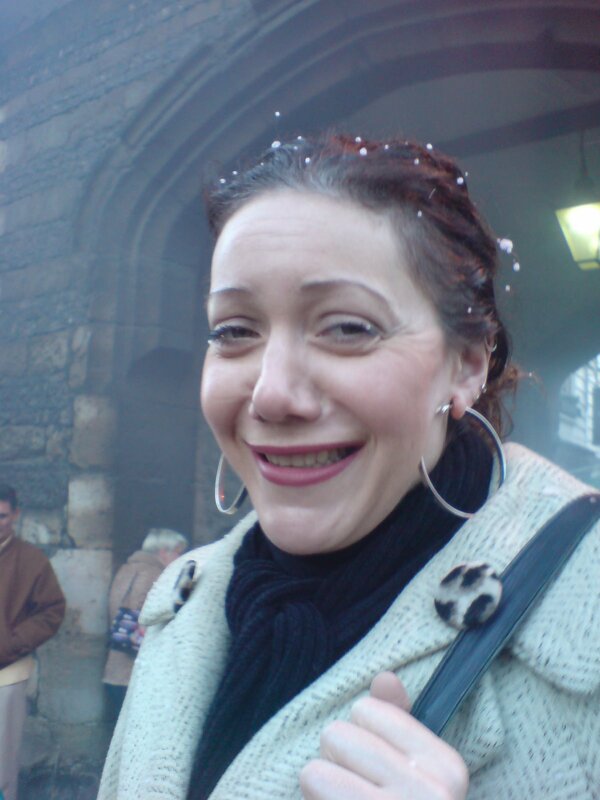 Older: Cough, Sneeze, Snot – What a way to start 31yrs old! Hey – I can’t remember full HM Treasury email address is but can you pass this link onto Richard – the world’s hottest chili pepper apparently comes from Dorset! !http://www.timesonline.co.uk/article/0,,2-2113507,00.htmlTell him I dare him to put one in his soup at lunchtime. And then make sure to record a movie of his head exploding with your mobile phone.